Two prominent exhibitions that take place this month will shine the spotlight on the construction and interiors sectors, both of which have had a flourishing run in the Gulf region over the past many years. gulfBID, an event for the building materials and construction sector, and gulfInteriors, which presents décor products and designs, have been organised by Hilal Conferences and Exhibitions (HCE) and enjoy the patronage of the Prime Minister, HRF Prince Khalifa bin Salman Al Khalifa. 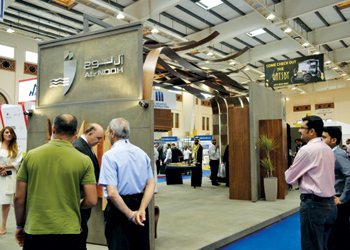 They take place from April 26 to 28 at the Bahrain International Exhibition and Convention Centre. Both shows have a special focus on the Northern Gulf where much has been happening in the two sectors. Exhibitors will present their latest offerings and technologies ahead of World Cup-related projects. Saudi Arabia, which is tightening its belt in the aftermath of the oil price slide, has still many high-value projects ongoing or due to begin, especially government housing schemes and ones that are critical for national development. Bahrain’s Al-Nooh Wood Design, a top designer and manufacturer of custom wood exteriors and interiors, will launch its luxury flooring product Quick-Step Livyn at gulfBID. “gulfBID has proved to be a successful showcase for our company. It provides us with access to new customers across the GCC, especially in Saudi Arabia, said Hassan Al Nooh, managing director of the firm. “The Quick-Step Livyn is a collection of luxury vinyl floors that combines the natural look and feel of quality crafted wood with the practical benefits of vinyl tiles,” he added. Quick-Step Livyn is available in a wide variety of colours and designs. “Al-Nooh Wood Design’s approach to gulfBid takes advantage of the business potential at the Northern Gulf’s leading show for building material. The launch of their Quick-Step Livyn flooring systems is an exciting new product addition on show for visitors to the exhibition,” said Jubran Abdulrahman, HCE managing director. Saudi-based Rezayat Protective Coating Company is set to showcase its innovative corrosion preventive rebar at the same event. Rezayat is a major producer of fusion-bonded epoxy-coated rebar (FEBCR) which is widely utilised in the construction of buildings, highways, bridges, culverts and tunnels. “We participated last year at gulfBID and received rave reviews, particularly for our FBECR. This product will take centre stage at our participation this year,” remarked Riyadh Al Homoud, the general manager of Rezayat Protective Coating. “The epoxy powder film protects steel from corrosion by eliminating contact between steel and corrosion agents such as moisture, chloride and industrial chemicals,” stated Al Homoud. Part of the Rezayat Group, the company operates a plant in Dammam’s Second Industrial City with annual capacity of 100,000 tonnes. Haji Hassan, a Bahrain-headquartered construction-focused group, has for the second successive year signed up as a strategic sponsor of gulfBID exhibition. Haji Hassan Group, which has joint venture partnerships across the GCC, is a conglomeration of complementary businesses which have been serving the construction and industrial services sectors in Bahrain and the region since 1952. The company manufactures precast concrete, ready-mix concrete, plastic and sewage pipes, construction chemicals, concrete blocks, steel reinforcement products, rubber material and mechanical engineering spare parts, all of which are essential for the construction sector. The group has an impressive track record of high-profile construction projects in Bahrain. This includes the Sitra Causeway, Durrat Al Bahrain, the North Manama Causeway, runway upgrades and new apron stands at Bahrain International Airport, and the Sofitel Bahrain luxury resort hotel. “The participation of Haji Hassan provides visitors an insight into an iconic company which has been involved in the building materials sector in the GCC and has developed products to meet the ongoing requirements of the GCC construction sector,” said Abdulrahaman. Titolo Design and Build, a Bahrain-based decor design company, will be showcasing its world-class interior products and exterior services at the gulfInteriors exhibition. The firm has a unique approach to interiors by providing clients with a blend of classic and modern brands from Europe and Asia. Titolo provides clients with their own design concepts in exterior, interior and landscape projects - also featuring products in furniture, sanitaryware, cabinets, lighting, accessories, kitchen and flooring products from Germany, China and Turkey. “We are proud of our Bahraini heritage. Our company participates at international events and are building a reputation of design excellence created in Bahrain. The gulfInteriors exhibition provides us with a B2B and B2C showcase in our home base, which attracts a wide audience from the GCC,” said Fatima Al Ansari, interiors director of Titolo Design and Build. Some of the challenging projects Titolo Design has undertaken include Bahrain Development Bank outlets, Bahrain Polytechnic premises, Hala Al Turk villa, the Royal Tulip Hotel in Amwaj, the Kazerooni villa and notably the Cleveland Clinic in Abu Dhabi. “The participation of local designers such as Titolo will add an exciting ‘designed in Bahrain’ aspect to the gulfInteriors exhibition. Companies such as Titolo add to Bahrain’s reputation in the GCC as a market producing luxurious, creative and high-quality interiors and exteriors,” said Abdulrahman. GulfInteriors is strategically supported by KMC Building Materials and Equipment and Hempel Paints. Bahrain’s leading interior design brand Mobilia Uno will showcase its modern furniture designs at the gulfInteriors. The company will offer special discounts for buyers at the exhibition. Designed in Bahrain, Mobilia Uno’s catalogue of products also includes interior accessories such as chandeliers, lamps and lighting along with curtains, carpets and wallpapers. “We are thrilled to announce that we will be providing special packages and discounts to visitors of gulfInteriors 2016,” remarked Zahra Haji, the managing director of Mobilia Uno. “For Mobilia Uno, we see gulfInteriors as an important promotion tool for our designs and products. Our designs are a proud statement of modernity and sophistication that are concepts designed in Bahrain,” said Haji.